Imagine a lost princess. She’s far from home, her true identity unknown or unrecognized, and she’s desperate to convince others of her identity so she can claim her rightful inheritance. It sounds like a fairy tale, and that might be one reason why the story of Anastasia Romanov, the lost Grand Duchess of Russia, continues to fascinate more than a century after the Russian Imperial family was assassinated by Bolshevik revolutionaries in the summer of 1917. In her third novel, Ariel Lawhon imagines the life of 17-year-old Anastasia in the year-and-a-half following her father Tsar Nicholas II’s abdication, when she and her family were imprisoned, first in their palace outside of St. Petersburg and later in Siberia and Ekaterinburg. Meanwhile, a parallel narrative tackles the thorny mystery of Anna Anderson, the woman who appeared in a Berlin mental hospital in 1920 claiming to be Anastasia. Soviet misinformation about what had really happened to the family and the fact that no bodies were recovered until decades later made her claim at least somewhat plausible. "[S]uch is Lawhon’s skill as a writer that even readers familiar with Anderson’s story will be willing to believe that it could be heading in a different direction." I WAS ANASTASIA’s dual stories move forward and backward in time to converge in July 1918. (Lawhon has some compelling reasons for choosing this inventive and risky structure, which she outlines in a lengthy author’s note at the end of the book.) When the novel opens, Anderson is living in Virginia, married to a professor, and still asserting her claim to her royal title. Methodically, Lawhon moves back through the years, as Anderson bounces between Europe and America, relying on the kindness or credulity of Romanov relatives and sympathizers who support her claim. It’s a sprawling, complex tale, told from the point of view of one who is unwilling to reveal all her secrets to a skeptical world. Anderson is stubbornly poker-faced throughout. Yes, she carries a few Romanov family tokens with her, and her body is riddled with mysterious scars. But when pressed with specific questions, she won’t (or can’t) provide the information that would verify her claim. People either choose to believe her or they don’t, and their decision is usually based more on their own motivations and personal history as it is on cold hard facts, of which there are remarkably few. In fact, such is Lawhon’s skill as a writer that even readers familiar with Anderson’s story will be willing to believe that it could be heading in a different direction. The uncertainty about Anderson’s real identity gives the book its narrative urgency. When will we find out who she really is? But it creates a problem as well. Since we can’t know for sure if Anderson truly is Anastasia Romanov or “the thief of another woman’s legacy,” it’s nearly impossible to understand her motivations. 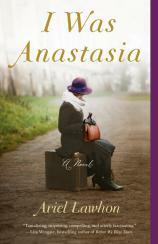 If she is the true Anastasia, her determined quest to be recognized for the woman she really is makes sense. But if she is an imposter, what’s driven her to pretend she’s the missing grand duchess? Lawhon gets to the answer eventually, scattering clues throughout that hint at Anderson’s real identity before revealing the truth in the book’s final pages. But the why of her actions remains oblique, despite a brief epilogue that attempts to tie things together in a neat bow. While Anna Anderson remains a cipher throughout I WAS ANASTASIA, Anastasia Romanov springs to life, full of energy and teenage spirit, even as the only world she has ever known collapses around her. The result is a vivid portrait of Romanov family life, with many elements drawn straight from the historical record, and of a young woman growing up in almost unimaginable circumstances. From the moment we meet Anastasia, as she reassures her sickly younger brother Alexey as the rebel army encircles their home, we know the Romanov family story is hurtling toward a grisly conclusion. That looming tragedy makes the vivid details Lawhon includes, like the taste of a summer pear from the Tsar’s garden or the feeling of Anastasia’s first kiss (with one of her captors, no less), especially poignant. Ultimately, Lawhon suggests, the world’s fascination with Anastasia Romanov and Anna Anderson is rooted in our “irrational hope and…willing suspension of disbelief,” part of a desire to believe the impossible and give an innocent young woman a chance at the life she never had. The tale Lawhon spins instead is one of two women, one moving toward unspeakable tragedy and the other recovering from it. It might not be a happy story, but it is a fascinating one.